I am extremely pleased to be able to announce that some very hard work on the part of Sophy Miles, Professor Anselm Eldergill, Kate Edwards and I over the past year have borne fruit in the shape of Legal Action Group’s Court of Protection Handbook. 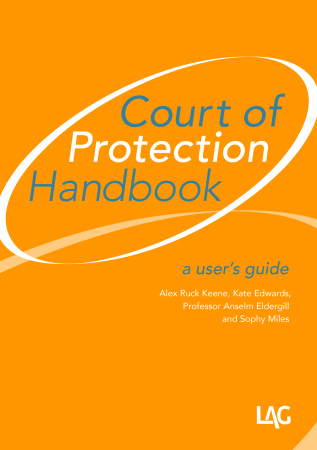 It is the first book to address in detail the practice and processes of the Court of Protection – across the whole range of its work – in terms that are aimed not solely at lawyers but also to the increasing numbers of people who either by choice or otherwise are involved in proceedings before the Court of Protection without legal help. The book, which starts with the story of Mark Neary’s experiences of the Court of Protection, then provides an overview of the Mental Capacity Act 2005 and the Court , before turning to a step-by-step guide through the processes of preparing and making an application, funding and representation issues, preparing for and appearing at hearings, evidence, costs, enforcement and appeals. Specific topics that arise in connection with the Court, such as applications made in relation to the Deprivation of Liberty Safeguards, the role of the Public Guardian, medical treatment cases and cross border matters are given detailed treatment and the main text is supported by a wealth of supplementary materials: legislation, guidance, precedents, sample orders and useful addresses. It also, as a bonus, comes in a particularly frisky shade of mango to ensure that it stands out on the shelf. The Handbook costs £48 in paperback from LAG and from Amazon. It is also available in a Kindle ebook version for £39.55. [Full disclosure – the links to Amazon are set up in such a way that, without any effort on your part, you are supporting the work of the excellent Mental Health Law Online]. The full table of contents is available here; by way of a taster, I can also offer a sample chapter on cross-border matters (I note that this is also shameless cross-promotion for other major product of my sabbatical year, the book on the International Protection of Adults I have co-authored, to be published by Oxford University Press in December). The Handbook is also accompanied by a website that will be maintained – in the first instance – by Sophy Miles and I, on which you will find links to relevant statutory materials and other guidance that space precluded us from including in the appendices, precedent orders covering most of the most common situations that arise before the Court, useful (free) web resources, and updates on practice and procedure before the Court of Protection. These updates take the form of posts on the site’s blog, and also (where relevant) updates cross-referenced to the relevant paragraphs in the book. Posted in Case commentsLeave a Comment on Court of Protection Handbook is here!